Here are my thoughts on the actual book.It starts off with the discovery of the body parts.Then it goes into the history of the victim Willam McGuire and also of Melanie McGuire the wife until they day they meet and then details their life together.And then William Mcguire disappears and so begins the investigation and the rest is history. This book is brilliant in many ways but the best part for me is how the investigation and court case details is written.I normally do not like books where the court case is so detailed but with John Glatt it is written so well that I actually enjoyed this part and I might go as far as to say it was the best part of the book.Which makes it a very good book as the investigation and court case covers 50% of the book and yes, I actually went and worked this out. Given my doubts as to whether this woman actually did this you will understand why my peeve about this book is the way that it not very objectively written.Maybe it is my own personality of always trying to protect the underdog,that I find myself with some doubts as to her guilt.Maybe it is because I cannot imagine doing anything like this.I cannot understand why she would do this instead of just divorcing him.Why take the chance on losing her children?It does not make any sense to me. Do not get me wrong,there is a lot of evidence pointing her way but it is mainly circumstantial evidence.Not one bit of DNA links to her.I have no idea about this woman's guilt and all I can say is that this book has left me with a very heavy feeling in my heart. It is well written and is a very easy read in that there were no legal terms that left the reader grabbing for a dictionary.All in all I enjoyed this book just not the ending. 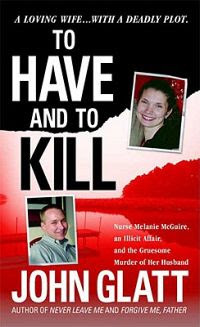 I read this book in March 2009 and it has 8 pages of photographs including those of the victim,the wife and the house that they had just bought before William Mcguire was murdered. Actually, her DNA, in the form of hairs cut at both ends (either her leg or underarm hair) were found, mixed with her dead husband's hair- stuck to the tape used to close the trash bags containing his body. The same identical trash bags found in both her house, and her parent's house. His body was dismembered in their bathroom. That's how BOTH of their hair ended up on the tape. No way around it. She is guilty. And...the wife's DNA dispels the incorrect assumption that this case was based only on circumstantial evidence. It puts her with the body. Buying a gun 2 days before the murder, lying to police, 38 various internet searches on "how to commit murder", her torrid affair, her planting his car in Atlantic City (and admitting to it only after she thought she had been captured on videotape), her attempt to have 2 incriminating charges removed from her E-Z Pass (total of 90 cents! 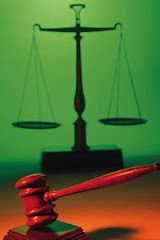 ), her trips down towards where the body was dumped, lying to the Family Court judge, her multiple lies regarding the reason she bought the gun, her 2nd storage unit (which she did not offer to police) which contained her husband's wallet, etc. etc. etc. There was a boatload of evidence that pointed in only one direction- to the wife. She's guilty. No doubt about it.